This training courseware title provides everything you need to professionally deliver Project Management Training: Understanding Project Management training including editable training manual, hands-on exercises, exercise files, detailed instructor guide, classroom-ready PowerPoint slides, and unlimited online learning licensing. 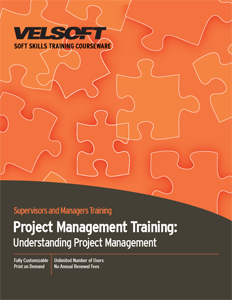 Seeing is Believing This sample manual to teach Project Management is in MS Word format. Our training materials offer courseware that trainers can implement with almost no preparation! This three-day course includes an introduction to project management for new leaders. We've included tools, tips, and fundamentals like critical pathing, Gantt Charts, PERT Diagrams, action planning, and much more. They'll complete the interactive course with experience making a project presentation. They will also be ready to write reports, manage budgets, and more. These interactive training materials include a pre-assignment, detailed instructor guide, student manual, pre and post assessments, quick reference guide, and more. If your students like to learn from their mobile devices, ask about our blended learning.